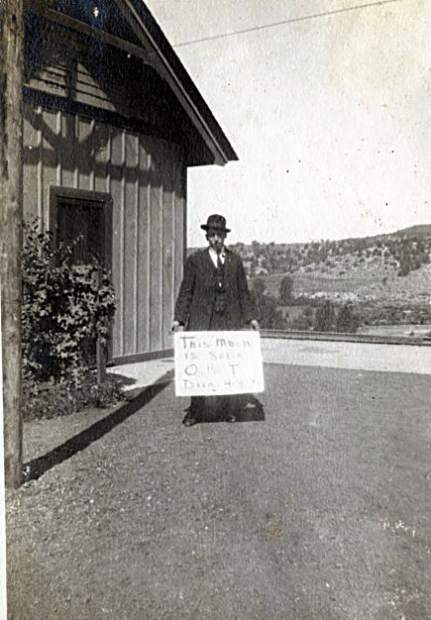 An unidentified man, who was possibly on his way to enlist for World War I military service,stands outside the Kent section house holding a sign that reads "This much is solid O.R.T. Divn. 4.". The town of Eagle planned for an 8 percent increase in sales tax revenues for 2018 and the big ticket capital projects included work on the Eagle River Park, planning for the Lower Basin Water Treatment Plant and an overhaul of the Eagle Town Park playground. Chuck and Pearl Taylor were the first residents to move into the assisted living wing of the new Castle Peak senior care facility in Eagle. Gypsum firefighters drew high praise for their quick response to a house fire in the Cotton Ranch neighborhood. No one was injured in the blaze. A stomach virus swept through Brush Creek Elementary School, prompting several families to keep kids at home and requiring the school to send several other students home. Eagle resident Phyllis Johnson was featured in a winning entry sent to America’s Funniest Home Videos. The video showed Johnson’s excited response to the news that she was going to be a great-grandmother. The Eagle County Fair & Rodeo presented a $1,414 check to the Shaw Cancer Center — proceeds from the event’s annual Tough Enough to Wear Pink night. A ribbon cutting ceremony was held for the Eagle-to-Gypsum ECO trail. The 2.7 mile bike/pedestrian path located north of U.S. Highway 6 ran from Violet Lane in Eagle to the Cooley Mesa Road intersection. A heavy, wet snow played havoc with the leaf-ladden trees around town. One of the hardest hit areas was Eagle Town Park, where two statuesque Siberian Elm trees were deemed so unstable that they had to be cut down. Construction was complete at the spray park area at Freedom Park in Edwards, but the county noted the water feature wouldn’t be turned on until spring. National hotel chains discovered Eagle. For many years, the town had a modest 65 hotel rooms available. Within a 15-month period that number had mushroomed to 340 available rooms. Eagle Valley High School senior Kelly Gray received the Red Ribbon Award from the Colorado Federation of Parents for Drug Free Youth. Gray was nominated by EVHS teacher Susan Scott in recognition of her involvement with the Devils Against Drinking and Drugs group. Four Eagle Valley Middle School sixth graders — Maddie Bernardt, John McGee, Rachel Reiter and Meadow Didier — participated in a Channel 6 newscast from the PBS station’s studio in Denver. D.E. Johnson, who had served as president of the Eagle Valley Television Corporation since the organization was founded in 1956, invited interested residents to attend a general meeting to elect new officers. The EVRC owned and maintained equipment on Castle Peak. which transmitted five over-the-air television signals to the Eagle and Gypsum areas. Eagle celebrated another successful Oktoberfest. The event, held at the old Eagle Recreation Center down town, was organized by Rosie and Uli Burki. Eagle County School District administrators recommended denial of plans for a new boys soccer program at Battle Mountain High School. The addition of boys baseball at EVHS was still being considered. EVHS junior Melondee Newby toured the Soviet Union as a student ambassador from the Future Homemakers of America organization. Bowing to pressure from a large group of lower valley teachers and citizens, the Eagle County School Board voted unanimously to spend $100,000 to begin design of the new Eagle Valley Middle School. EVHS teacher Ralph Starr acted as spokesman for the group that was lobbying for the new school. The town of Eagle planned a special meeting to discuss fluoridation of its municipal water supply. Duane Lister and Marcie Smith were the winners of the Eagle Elementary writing contest. The Eagle Valley Enterprise celebrated its 69th birthday. EVHS presented the musical comedy “Get up and Go.” Connie Eaton, Karen Walker, Lynda Shelton, Jeanie Burton, Randy Long, Paul Mayne and Ron Norris played lead roles in the production. Pauline Rochford was promoted to assistant cashier at the First Bank of Eagle. Eldon Bindley, 14, put his name in a drawing at the Boat Show in Denver and he won a free, four-day trip to Arkansas for himself and his parents, Mr. and Mrs. Ira Bindley. Ferris Kirby of Eagle had a hunting season scare. His horse was shot out from underneath him by an errant hunter. Kirby was hunting along Sunnyside Creek when the shooting occurred. Kirby had to put down the horse and he thought he knew which hunter had fired the shot, but when questioned, the stranger denied any involvement. Justice of the Peace Hank Knuth had a busy day in court. He sent a Benton Ranch hand to jail for 60 days for an assault on a fellow employee, charged a Denver hunter in connection with an assault that sent a man to the hospital with a cracked skull and fined a Minturn man $10 for disturbing the peace by setting off a charge of dynamite at the back of the Country Club. The Knoonce Company opened its Phillips 66 gas station in west Eagle (now the site of Moe’s Original Barbecue). Mick Randall was the station manager. A man from Elbert County was shot and killed by his hunting partner. The accident happened in the Milk Creek area. There was also a very unusual hunting accident in the Sweetwater area. A hunter was actually shot by a deer. According to the report, the victim had successfully felled the dear and was preparing to cut the animal’s throat when a reflect action caused the muscles of the dead animal to contract. The dead deer kicked the hunter’s loaded gun, sending a round through the man’s left hand. Three Army prisoners escaped from a prison train running between Pando and Red Cliff. One was injured in the jump from the slow moving train, one was shot by guards and taken to the Gilman hospital and the third successfully hopped another train and made it to Leadville before he was captured. The Rev. George Eller oversaw a redecorating project at the Lutheran church in Gypsum. A drop in potato prices prompted local growers to feed their spuds to their cattle. The Eagle County High School football team shut out Appleton 26-0.